Macknyfe Strippers, “Dee-tailers”, and Muckrakers are used worldwide by top winning exhibitors and handlers of wire-coated breeds. The distinctive “fish tailed” handle reduces twisting of the tool in the hand during use which reduces the formation of blisters and sore spots. 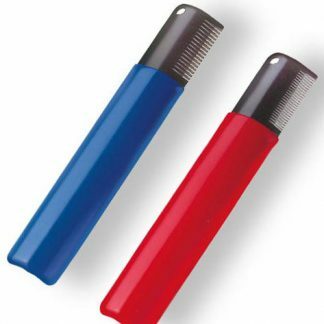 The rounded corners of the blades and flats on the ends of all teeth reduce the chance of cuts and scrapes to the dog being groomed. 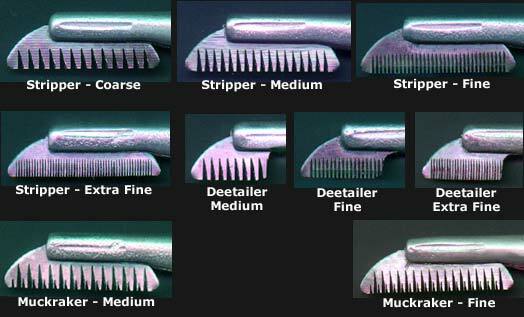 All of these tools are carefully treated to reduce sharpness of the blade, thereby reducing the amount of hair cut instead of stripped.In use, these tools should not cut the hair but grab it, in conjunction with the thumb, enabling the groomer to remove the hair easily from the animal.